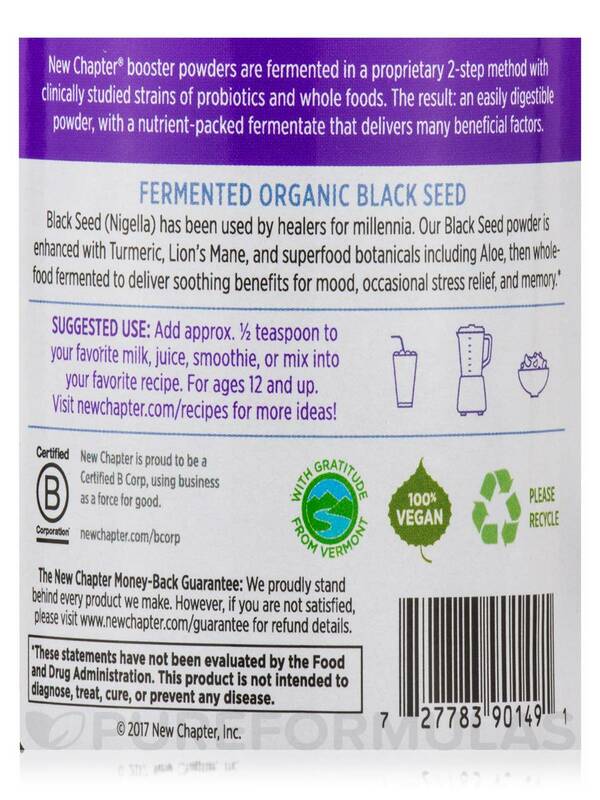 Fermented Black Seed Booster Powder is an organic dietary supplement‚ formulated with ingredients such as Black Seed (Nigella)‚ Lion’s Mane‚ and Turmeric. It also includes Aloe‚ a botanical superfood. 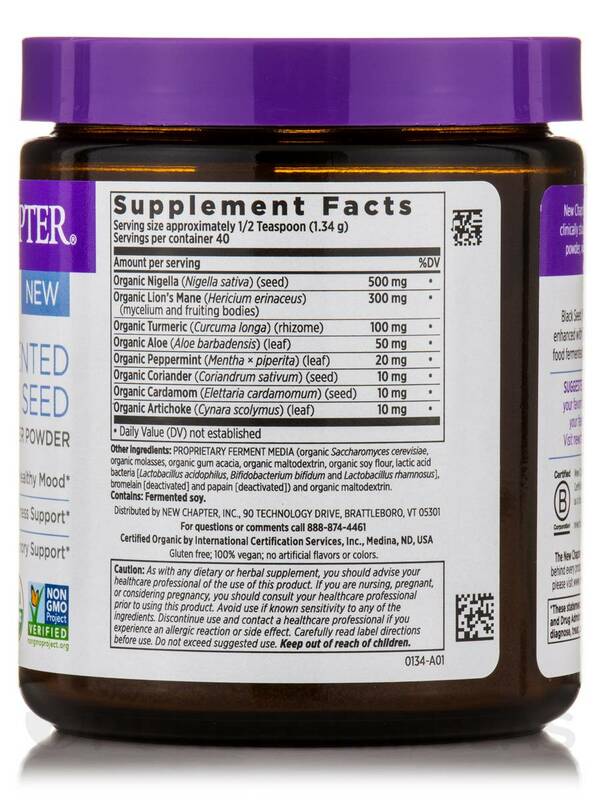 The powder delivers soothing benefits and is easily digestible. 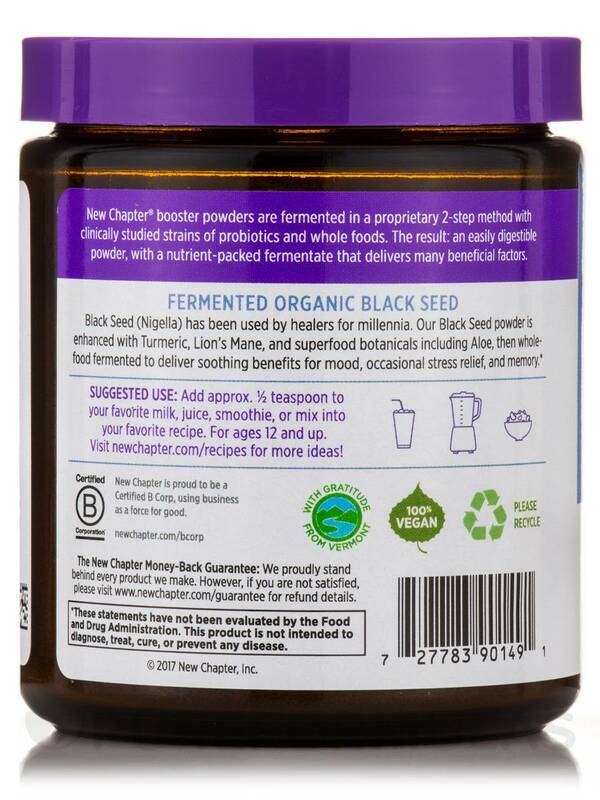 Fermented Black Seed Booster Powder is Non-GMO Project Verified‚ Kosher‚ gluten free‚ 100% vegan and USDA organic. 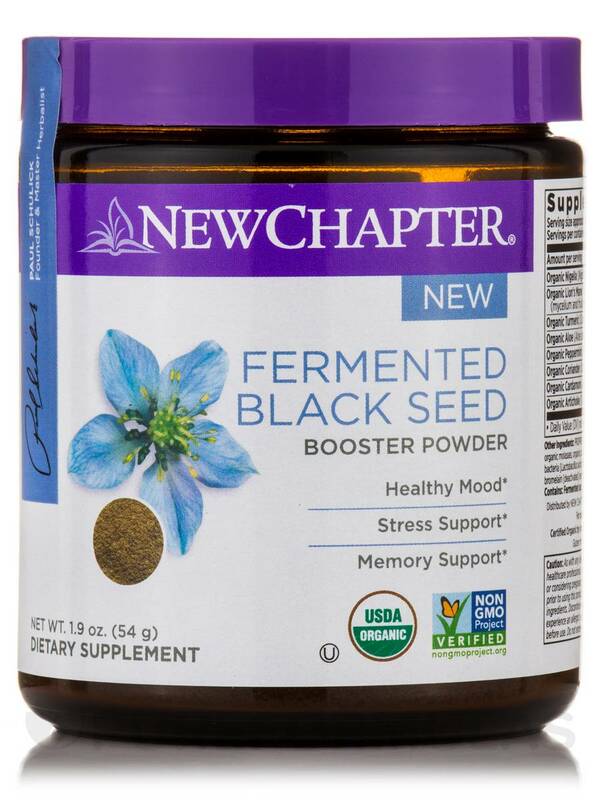 Fermented Black Seed Booster Powder offers occasional stress relief and memory support‚ while aiding a healthy mood. 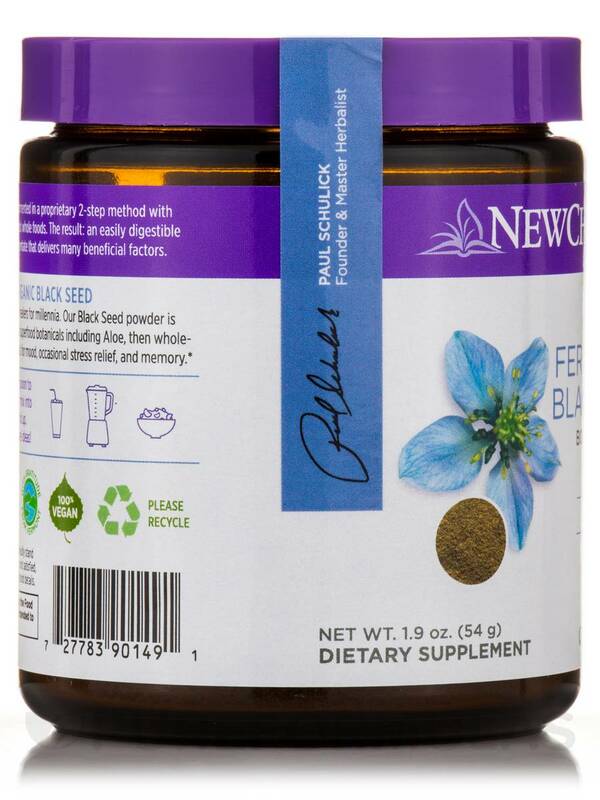 It combines the power of Black Seed (Nigella)‚ Turmeric‚ Lion’s Mane‚ and Aloe‚ with a nutrient-packed fermentate‚ to deliver a supplement that soothes and provides holistic wellness support. Other Ingredients: Proprietary ferment media (organic Saccharomyces cerevisiae‚ organic molasses‚ organic gum acacia‚ organic maltodextrin‚ organic soy flour‚ lactic acid bacteria [Lactobacillus acidophilus‚ Bifidobacterium bifidum and Lactobacillus rhamnosus]‚ bromelain [deactivated] and papain [deactivated]) and organic maltodextrin. USDA Organic / Non-GMO Project Verified / Kosher / Gluten-Free / Vegan / Vegetarian. Add approx. 1/2 teaspoon to your favorite milk‚ juice‚ smoothie‚ or mix into your favorite recipe. For ages 12 and up. 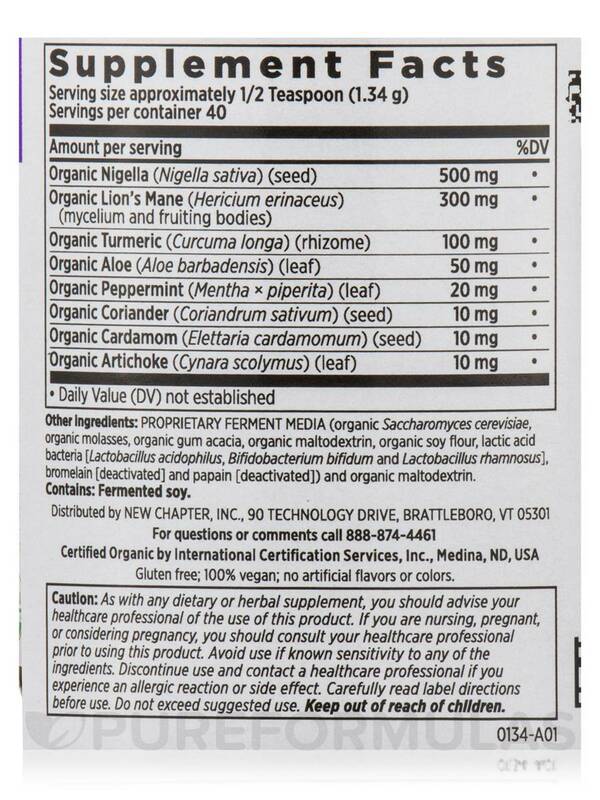 As with any dietary or herbal supplement‚ you should advise your healthcare professional of the use of this product. Avoid use if known sensitivity to any of the ingredients. Carefully read label directions before use. Allergen Caution: Contains Fermented Soy. Discontinue use and contact a healthcare professional if you experience an allergic reaction or side effect.